Microsoft's updated spreadsheet tool isn't getting a lot of new, whiz-bang features, but it is becoming more functional. That's something both new and experienced users will enjoy—especially a new approach to an old problem that used to require a cumbersome workaround. Complex tasks become easier to perform, thanks to tools such as Recommended Charts and Recommended PivotTables tools. Other changes place choices closer to your data, and use big-business brawn to crunch data right into Excel. To help you get up to speed, read on for 10 new features that make your work easier in the new Excel. Want to know more about the new Office suite? You'll find our full review of Office 2013 here, as well 10 killer features in the new Word 2013 here. 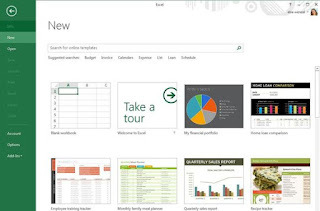 Excel's new Start Screen helps you get to work more quickly. Along its left edge are the most recently used worksheets, any of which can be pinned to your Recent list so they will always be visible. Here, too, you can click Open Other Workbooks to access your files from a disk or the cloud. 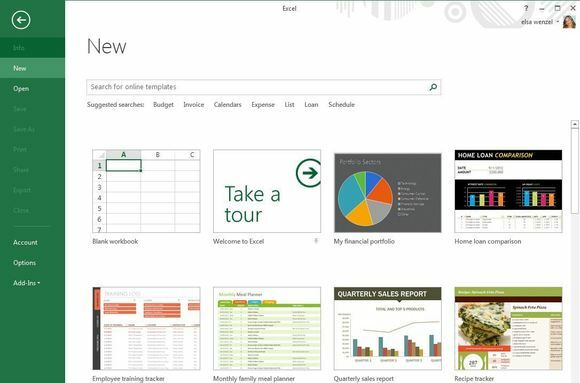 The Start Screen's top-right corner also shows the SkyDrive (or SharePoint) account you are currently connected to. A range of templates appears here to help you quick start a project. These can also be pinned, or you can use the search feature to look online for other templates. A list of suggested searches can help you get started. New users will appreciate the template choices, and existing users will likee the Recent file list and quick access to existing files. Although the Start Screen can be disabled, I find it useful enough to stick with it. The Open tab has links to recently accessed files and locations.